MATRU KI BIJLEE KA MANDOLA is the new comedy drama movie from Bollywood director Vishal Bhardwaj. Set in a rural village in the state of Haryana, India, its storyline balances farce and dark humor with a serious theme of how poor farmers can be exploited by politicians and the rich in today’s India. The film was one of the first in India to record in ARRIRAW with ARRI ALEXA cameras; cinematographer Kartik Vijay recently spoke with ARRI about his experiences on the shoot. ARRI: What kind of a look were you going for on this production? Kartik Vijay: The film is a dark comedy that takes place mainly in a single town in North India. I wanted naturalistic imagery for the film, with plenty of shadow detail. There were a lot of moments where I wanted the characters to be in shadow and yet still to see their expressions. It’s amazing how much detail the naked eye captures when there’s no or low light, so I did sometimes try and capture that kind of look. ARRI: What made ALEXA the right choice of camera? KV: Almost 70% of the film is set at night and I had a lot of practicals being used as my main light sources. I had worked with the ALEXA before and knew what it could do for me, to help achieve the look that I wanted. It’s actually scary sometimes, when you see how much information that sensor gives you! Also, the ALEXA is no-nonsense and really easy to use, and it was great to be able to get HD dailies straight out of the camera. ARRI: Did you hire the ALEXAs from within India, and is the camera having an impact on the industry there? KV: Anand Cine Service in Chennai supplied the entire camera package, including the ALEXAs and the Codex recorders. ALEXA is having a significant impact in India. This feature is one of the first commercial Bollywood features to be shot in ARRIRAW, but there have previously been several features that shot on ProRes. ARRI: Can you give an example of a low light scene where ALEXA’s sensitivity proved helpful? KV: There’s a scene that is set in some wheat fields in the middle of the night, with no practicals whatsoever to facilitate the lighting. I had to emulate moonlight and keep it as natural as possible – the ALEXA was perfect in giving me enough exposure and maintaining detail in the shadows. Another good test was a scene where the central character stands at the door of a warehouse looking at some sacks of grain. The camera was placed inside, looking back at the door. We had lost the light outside and I needed something to facilitate the ambient light inside; even the smallest light fixture was proving to be too much. I ended up bouncing my 1st AC’s basic LED torch into the ceiling! I pushed the sensor to EI 1280 and it was perfect. ARRI: Were there also situations involving bright sunlight? KV: All the day exterior scenes were shot in direct sunlight. We had a lot of shots where the camera was looking straight into the area that was blowing out, but the ARRIRAW footage held a lot of the information within those highlights. ARRI: What were your monitoring and dailies solutions? KV: We had an on-board Transvideo CineMonitor HD on each camera and bigger Panasonic monitors on set. Vishal and I worked mainly off the on-boards. The DITs on the job used to give me HD dailies on a dedicated hard drive that I had given them. I would often hook up my MacBook Pro to the HDTV in my hotel room, with the help of an HDMI cable. For focus checks, I would mostly check the footage on my MacBook Pro. ARRI: What lenses were you using and why did you choose them? KV: I worked primarily with ARRI Master Primes, purely because they’re really fast lenses. This, along with the sensitivity of the ALEXA’s sensor, allowed me to experiment and simplify the lighting style that I used for the film. A lot of the film was shot at a T-stop of between T1.3 and T2.0. I also had short and long Optimo zooms. ARRI: What route through postproduction did you take? KV: The grade is presently being done at Reliance MediaWorks in Mumbai. I am working on the Baselight, which makes it easy as you can work on the raw image directly, without any conversion. The final output is going to be on film as well as digital, as both types of projection are used in India, although there is now more digital than film. 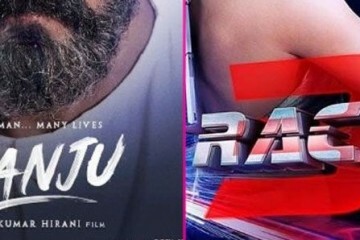 Can Ranbir Kapoor’s Sanju beat Salman Khan’s Race 3 on Day 1 at the box office?